It is 10 years since I ran my last marathon. I have been running again quite often since the beginning of 2011, and a few of you know that in October 2011 I’ll be running the next Toulouse marathon if health permits. Some months ago, following a recommendation of my brother Jaime, I watched a movie in Youtube called “The Spirit of the Marathon” based on the experiences of some beginners during their training towards running the Chicago marathon in 2007. I strongly recommend the movie to anyone willing take on such challenge. In the movie, I especially liked the character of Lori, who apart of conveying a positive attitude all time and sharing a beautiful story behind, is running the marathon supporting a cause. In February, when I decided to take part in the marathon in Toulouse, I thought it would be nice to do as Lori did and try to raise some funds for a cause, for a charity. However, I didn’t know which one to choose nor how exactly to set it up. In the meantime months have passed by, I have not started raising any cash, but luckily my Airbus Running club has sorted out which charity I could run for. This year, all Airbus runners taking part in the Toulouse marathon are encouraged by the club to raise funds to help the association “Vaincre la mucoviscidose” which helps families of children suffering the illness and creates awareness about it. I think this is surely a worthy cause to run 42.195km for and raise some funds during the training period. How can you contribute to such cause? Easy, I have set up an ING savings account for that purpose. All contributions received in that account will be transferred to the associations bank account by 21st October. Since in France, contributions to charities are deducted from taxes up to a 66% and I do not want to get any tax benefit out of possible contributions from friends, I will double any contribution that you make so as to offset possible benefits and thus contribute myself to the cause as well, i.e. : if you give 5€ for the charity, I will put another 10€, making a total of 15€ for the charity, out of which 10€ would be tax-deductible, equal to the disbursement I had made. Apart from contributing to a worthy cause, I will explicitly dedicate my marathon in this blog to all those who have contributed to the cause (if they haven’t requested anonymity). What it’s more, in line with crowd funding initiatives, I have been working since January on a special project that will only be unveiled after the marathon. That project will also be dedicated to the contributors to that cause who will have the chance of enjoying it before the general public. All you have to do is give some euros to make up for that 33% that we will contribute to the children suffering from mucoviscidose. Let’s do it together! 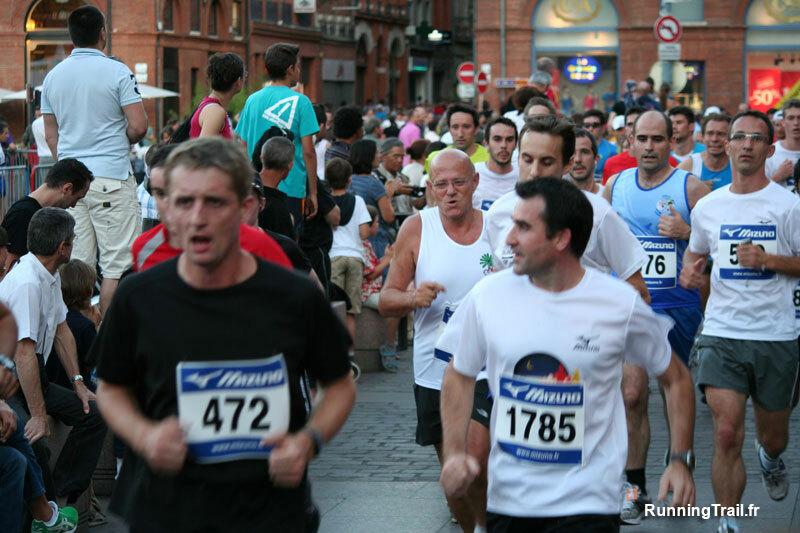 Running at "Corrida Pedrestre" in Toulouse, July 1st 2011. Such a cool idea! I will definitely contribute! Thanks! Glad that you liked the idea! 66% is tax deductable in France? Yes, 66%, or at least that’s what I’ve been informed (haven’t read French tax code :-S). Acabo de hacer mi donación del mes a una clinica de SF. (Un mes, una causa). Genial idea lo de una causa, un mes.